Wheeling, WV – The Women’s Giving Circle announced grant awards totaling $53,549 to ten recipients during award recognition on Friday, November 20 at Youth Services Systems in Wheeling. The Women’s Giving Circle (WGC), a component fund of the Community Foundation for the Ohio Valley, makes strategic, researched-based grants that facilitate systemic change to improve how women and girls are served in its community. WGC aims to apply creative solutions to critical needs and produce lasting and measurable impact on the lives of women and girls in the Ohio Valley. The grants were awarded through a competitive process to result in addressing the priorities as outlined by the mission of the Women’s Giving Circle. “The membership of the Women’s Giving Circle is proud to support these organizations in their efforts with programs directly supporting women and girls in the Ohio Valley. The projects are in alignment with the mission of the Giving Circle in addressing critical needs of women in our community” –Joan Stamp, WGC Chair. Belmont County Student Services -$5,000 for Girl’s Circle project to support at-risk girls. Family Connections -$3,100 Life Skills Development for transitional girls leaving foster care system. Girl Scouts -$5,000 for Girl Scout Leadership Experience to enable financially disadvantaged girls to participate in scouting. SMART Center -$1,745 for GEMS camp. Girls Enjoying Math and Science summer camp. Greater Wheeling Coalition for the Homeless -$7,500 for Female Empowerment program. 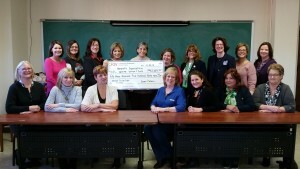 Wheeling Health Right -$5,000 for Breaking Free program to assist women to break free from patterns of an abusive past. WVNCC Foundation -$5,000 Emergency Assistance program to support women in times of emergencies which would preclude them from attending classes. YWCA -$1,500 Junior Board to be implemented to engage young girls in the nonprofit sector and encourage the volunteer role and community benefits of philanthropy. YWCA -$4,704 Family Violence Prevention program for upgrades to Madden House, a residential facility. Youth Services System -$15,000 Girls in Transition program to support girls aging out of the foster care system and to improve independent living skills. The WGC is building a community of women philanthropists and creating a permanent legacy to address the needs of women and girls in the Upper Ohio Valley of West Virginia and Ohio. The goal is to assist women and girls to achieve lifetime goals that might not otherwise be attainable without the support provided by the giving circle. In its grantmaking history, the Women’s Giving Circle has awarded over $165,000 to projects supporting women and girls. To learn how to become a WGC member, please call the Community Foundation of the Ohio Valley at 304-242-3144. Since 1972, the Community Foundation for the Ohio Valley has connected donors who care with causes that matter by making grants to organizations working to improve the quality of life in the Upper Ohio Valley. With assets of more than $34 million, the Foundation assisted in making more than $1,000,000 in grants last year. From strengthening community schools and assisting local arts programs, to building health centers and helping lives affected by violence or natural disasters, the Foundation continues to enhance our region. To learn more, visit the Foundation online at www.cfov.org. © 2019, Community Foundation For The Ohio Valley. All rights reserved. For The Ohio Valley, Inc.